Congratulations on your success in the electorate of Mudgeeraba and thank you for accepting my invitation to serve Queensland as the Minister for Science, Information Technology, Innovation and the Arts. · Ensure a consistent approach to IT systems and applications across Government to enable effective and efficient delivery of front line services. - Support the Minister for Health in resolving the Health payroll debacle. - Review the benefits management plan for both Identity, Directory and Email Services (IDES) and ICTC outlining performance measures, agency migration plans, estimated migration costs, savings and benefits. - Define timelines for (IDES) to ensure there are no further delays in this program. - Liaise with the Health Minister in relation to the IeMR server contract signed before the 2012 caretaker period. · Deliver the LNP’s election policy Science and Innovation for Economic Success, in consultation with Ministerial colleagues. · Oversee policy development for the Digital Economy. · Provide direction and policy development regarding the Queensland Government Chief Information Officer (CIO). Your priority will be to bring to Cabinet your recommendations for future roles of the CIO, including consideration of the CIO’s role and activities across the whole of government. · Establish mechanisms for research and development coordination and planning and innovation across sectors involving government agencies, universities and industry, including international collaborations, to improve Queensland’s economic performance with more effective and efficient services. 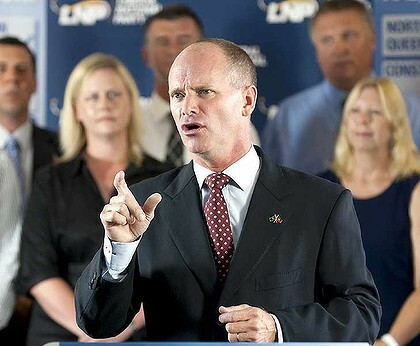 · Deliver the LNP’s election policy Arts for all Queenslanders. · Establish a Super Star Fund to promote our growing performing arts industry which organisations can apply for, to develop a major local production featuring an internationally known artist or artists. · Establish a Regional Arts Fund to extend the reach of current touring programs and to ensure that major State companies such as the Queensland Theatre Company, the Queensland Ballet, the Queensland Symphony Orchestra and Opera Queensland are supported in their goal of touring high quality arts experiences annually to regional Queensland. · Develop and implement a strategy for the growth of the arts sector in Queensland including a commercially oriented approach to artistic events and performances and facilities to have wide impact for Queensland communities. · Foster a ‘community of arts’ across Queensland involving artists and performers, for profit and not for profit organisations and community organisations and teaching institutions to contribute to the growth of the arts sector. In addition, there are existing strategies and programs implemented by previous governments which need to be examined. Such strategies and programs need to be assessed to decide if and how they might be retained, either in their existing or an altered form. You are to assess and make recommendations on the Smart State Strategy. Further to my letter of 10 April 2012, I write to clarify certain issues regarding your role and responsibilities as a Minister in my LNP Government. As you are aware, the dissolution of the former Department of Environment and Resource Management (DERM) in particular, and MoG changes in other Departments have presented some issues regarding the placement and role of government scientific officers. It is my intention that scientists from DERM and certain other Departments, and their functions, should be transferred to your Department of Science, Information Technology, Innovation and the Arts, and that the expertise and services of these scientists should be made available to other Ministers and Departments to perform specific research, projects and tasks. Therefore, I am tasking you with establishing and maintaining a new system to provide other Ministers and Departments with appropriate access via your Department to scientific assistance to meet their various requirements. It is my further intention that you take over responsibility for the management and administration of CorpTech, Queensland Shared Services (QSS), and Smart Services Queensland (SSQ) from the Department of Housing and Public Works as part of your Department and portfolio responsibilities.